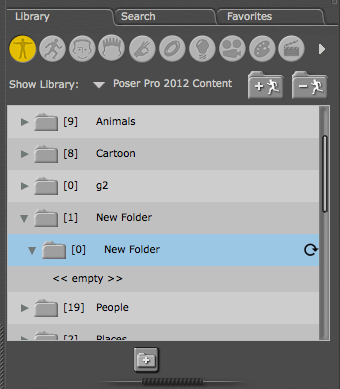 In Poser we have the ability to add and remove entire runtimes, save new items to those, delete them if and when we like, and we can also create folders inside our runtimes. We can remove items, but it seems we can’t remove folders – not even if they’re empty. This can get messy. According to this thread, SmithMicro made the decision not to include this option via the GUI because it would mean a potential plethora of “are you sure” dialogues when non-essential files need to be deleted. Instead they’ve left this to the OS tools like Finder and Windows Explorer. How then can we delete folders manually? How do we even know where that folder is buried deep inside the runtime structure? The answer is: the Extended Details Panel. It can show us the exact path which we can hunt for, or even copy and paste into command line tools. To bring it up, take a look underneath the library panel. Just under the “Folder Plus” icon there’s something like a handle to drag the size of the panel, the one that looks like some decoration. Turns out it can bring up a menu when you click it! Who would have thought? Worst UI design ever. Click it and navigate to Display, then check the tick box labelled Extended Details Panel. When enabled this will show the full path to the selected item (the one in blue), giving you a clue where a folder is buried. 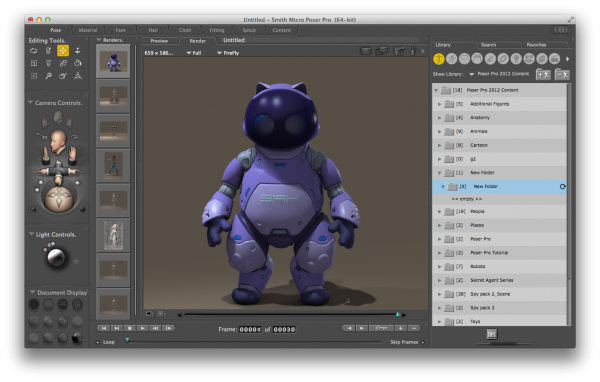 Armed with this knowledge we can now hunt to the location, remove desired items and then click the little refresh icon to make those changes show up in Poser. 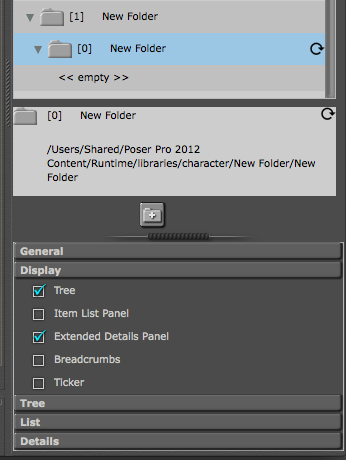 Note the ‘single quotes’ enclosing that path, this will alleviate problems if folders contain spaces.